significantly higher than the analysts' consensus of 21%, and in apparent defiance of the president, who has regularly expressed resistance to raising rates. The lira reacted strongly to the rate rise, initially up 5% in value to 6.0 lira to the US dollar, later settling up more than 2.7% at 6.15 to the dollar. 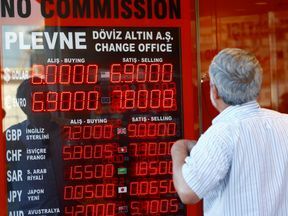 There had been indications from Turkey's central bank that it would raise rates, after inflation came in at nearly 18% in August, according to official data.